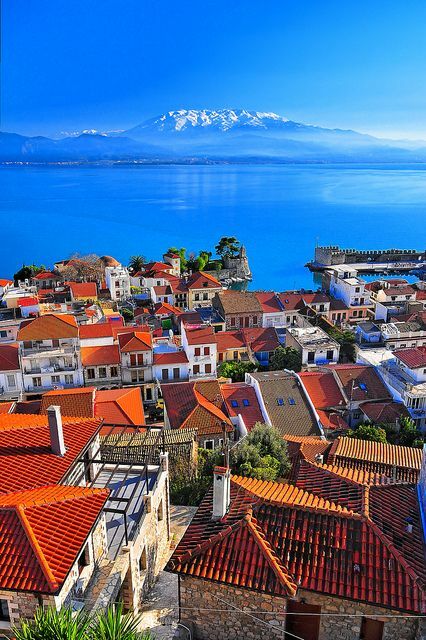 Naupactus or Nafpaktos is a town and a former municipality in Aetolia-Acarnania, West Greece, Greece. Since the 2011 local government reform, it has been part of the municipality Nafpaktia, of which it is the seat and a municipal unit. It is the third largest town of Aetolia-Acarnania, after Agrinio and Missolonghi. Naupactus is situated on a bay on the north coast of the Gulf of Corinth, 3 km (2 mi) west of the mouth of the river Mornos. The harbour is accessible only to the smallest craft. It is 9 km (6 mi) northeast of Antirrio, 18 km (11 mi) northeast of Patras, 35 km (22 mi)east of Missolonghi and 45 km (28 mi) southeast of Agrinio. The Greek National Road 48/E65 (Antirrio - Naupactus - Delphi - Livadeia) passes north of the town.